Training will be conducted through a variety of activities, such as preparation workshop/seminar, classroom observation and discussion, teaching rehearsal, student-teaching, teaching discussion, etc. Participants draft lesson plans, discuss them with the lead teacher and fellow participants, rehearse the lessons, teach them in a real classroom, and discuss the teaching afterwards. Participants can experience various types and modes of teaching: group classes, one-on-one tutorial sessions, face-to-face teaching, and online teaching. Program offers additional workshops that introduce task-based online teaching and teaching beginner learners in the target language. Participants have the opportunity to earn 3 credits. Once you become a student of the Chinese MA Program at Hunter College, those credits can be used for fulfilling your M.A. degree and teaching certificate. First Day of the Summer Session: June 25th (Tuesday). Mandatory Workshop: June 25th to June 27th. Week 1: Face to Face: June 28th. Week 2: Face to Face: July 1st and 2nd, and July 3rd. Online: July 5th. Week 3: Face to Face: July 8th to July 11th. Online: July 12th. Week 4: Face to Face: July 15th to July 18th. Online: July 19th. Week 5: Face to Face: July 22nd to 24th. Online: July 25th and July 26th. Week 6: Online: July 29th to July 31st. Participants who wish to earn credits but are not Hunter College students must apply for Hunter College’s non-degree graduate admission. (In order to be considered for admission, you must hold the equivalent of a US bachelor's degree.) As soon as you obtain the non-degree acceptance notice, contact us to get departmental permission to register for the course. To participate in the STARTALK program itself is free. 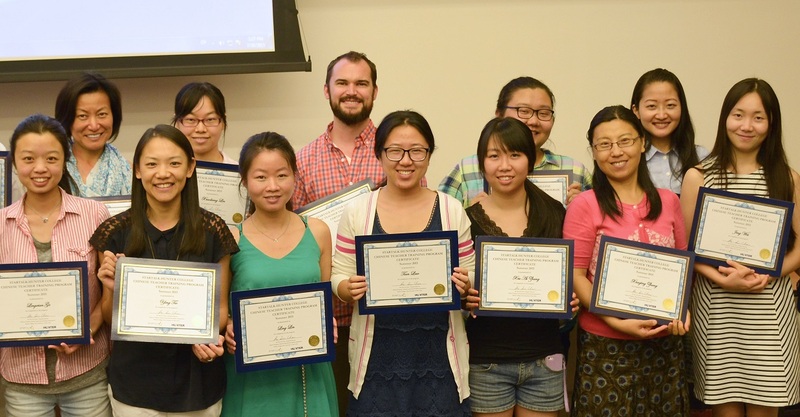 Participants will be awarded scholarship that can be applied to tuition expenses for a Fall 2019 semester graduate course in Chinese language pedagogy at Hunter College. Participants who take the course in the summer but not in the fall will still be considered for scholarship, if funding is available, but priority will be given to those who take course(s) in the fall. We will be enrolling 10 to 15 applicants (current or potential teachers at any grade level) who are interested in teaching Chinese as a foreign language. To be eligible, you will need to be a native speaker of Mandarin Chinese with standard pronunciation, or a speaker with advanced-level Mandarin proficiency (you should be able to read Chinese newspapers without using a dictionary). Priority will be given to students of the Chinese M.A. Program at Hunter College and those who intend to pursue a New York State teaching certification. To apply, please fill out the application form. Applications will be reviewed on a rolling basis until all the seats are filled. Monday, April 30: We are accepting applications for Summer and Fall 2018. Apply today. Monday, April 30: 2 Hunter Chinese Flagship Students Receive Boren Scholarship; 4 Students receive Gilman Scholarship!